The vocation and contributions of men and women of the Assumption parish and school who are consecrated to God by vows of chastity, poverty and obedience was recognized at Assumption Catholic School on Friday, January 26, 2018 when the annual World Day for Consecrated Life was observed. To commemorate the day, the students participated at the Divine Liturgy and after the service, Fr. 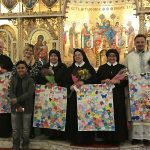 Ivan, Deacon Paul, Sister Yosaphata, Sister Thomas and Mother Maria the Superior of the (MSMG ) Missionary Sisters of the Mother of God were recognized for their service to God. 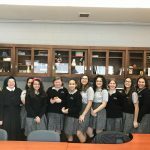 Mrs. Shumny the school’s Principle presented those in consecrated life with special gifts prepared by ACS students and in her beautiful remarks highlighted the gift of consecrated persons for the whole Church and Adssumption comunity. 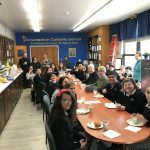 To conclude the celebration, the jubilarianswere treated to a breakfast served by the ACS 8th grade students.